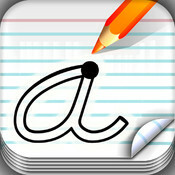 School Writing by Demografix is an App I’ve meant to review for some time. It has handwriting fonts for Australia, New Zealand, the USA and the UK. You might be mistaken for thinking it is only a handwriting App, when it is really a versatile App that can be used across the curriculum and is suitable for all ages. This App is for iPad only, but iPhone and iPod Touch users should still keep reading as there Demografix has an iPhone App, School Fonts, that is very similar, lacking only one of the major activities. Trace over each letter or number with pencils of varying thickness. Tracings are recorded and can be replayed or sent to the teacher. Three tracing modes are available for beginner scripts – Outline, a dotted letter or a solid letter. The outline also features a start point and arrows indicating the order and direction of each stroke. A Learn button shows an animation of the letter or number being drawn for beginner scripts. This feature is not available for the Cursive scripts, however teachers and parents can add their own recordings of letter tracings using the Customise section. Demografix has updated School Writing and School Fonts to include tracing accuracy. After students trace letters or numbers, they can receive a star or half star for tracing accuracy. If they are not very accurate with the tracing, they will receive a prompt to try again. They are given a maximum of three attempts before progressing to the next letter or number. There are three levels of difficulty for tracing: Easy, Medium and Hard. You might start beginners on the easy level, but then increase it as their accuracy improved. Tracing accuracy can also be turned off. It is really easy to add words or to edit the word list. I was able to create a custom ”Lesson” with 10 words, all with audio and photographs, in under a minute. Weekly spelling and sight word lists – As it is easy to set up a class set of iPads using DropBox, it would be really easy to change lists weekly. Personal information for students with special needs – including writing their phone numbers, names addresses and other personal information. Practice writing names – A class list with the child’s names plus his family and/or friends’ names as well would be a perfect prep activity. The iPad is used as a whiteboard where students complete activities. (This is the activity not available in School Fonts) There are currently 12 activities that install with the App, covering pre-writing, shapes, math problems, and vocabulary exercises. It is easy to create your own activity by importing images or drawing freehand on the Whiteboard. Cloze activities – close activities are where students fill in the missing words in a piece of text. Word lists may or may not be provided. The text for these activities can come from just about any subject. Mathematics Activities – Some of the strategies I discussed in an earlier post, Using Painting and Drawing Apps for more than just pictures, would apply here. Children could count objects and write the number, write sums, group tens, show groups for multiplication or complete patterns. The list is by no means exhaustive. Following directions – present the child with a picture and the instructions to draw items in particular places, for example Put a cat on the mat, or Put a ball under the table. Mapping skills – Trace routes or locate specific places on maps. You could trace the fire escape plan for your classroom, show different routes to get from A to B, or simply identify places in your neighbourhood. LOTE (Language Other Than English) – Writing Chinese or Japanese Characters, matching items to words. You can add unlimited student profiles. Records of how many lessons each student has completed are recorded. Student names are used when sending reports to teachers and parents. The video below shows the main features of the iPad version of the App. Demographix has more detailed videos available on YouTube and their website that show the various features in-depth. See below for the link to the Demografix website. Guidelines – available as standard or dotted thirds, with an optional mid-line. Guidelines can also be removed. Sounds – three sounds are available for tracing, plus encouragement sounds. These can b e turned off. Emails – teachers can have letter and number exercises sent to a nominated email address for review. Security – The App can be locked to prevent content and profiles being removed or edited. An option exists for students to be able to add profiles while the App is locked, however this is easily turned off. Import/Export lessons – by email, weblink, or DropBox. * New Feature – custom encouragement sounds – You can now record your own custom reward/encouragement sounds. External links are available on the main page but can be turned off through settings, as Demografix obviously respects the need for internet security for students. About Demografix – contact page within the app with links to other apps, social networking, the Demografix website and newsletter. Importing and Exporting activities – If you buy this App, I’d seriously consider keeping an eye on the Demografix website for more activities that you will be able to add to your App. I’d also consider submitting activities to the site. Use a Stylus – Tracing with a finger is one way to reinforce letter and number shapes, but I’d strongly recommend using a stylus to help develop good writing skills with a good pencil grip. There are heaps available, but the one I would use for beginner writers is the Gecko Glow stylus with its non-slip rubber exterior and its tripod grip. Posture – iPads are transportable, so sometimes they may not be used with classic good-handwriting posture. Do your best to make sure children are seated well when practicing their hand writing. I know it doesn’t sound important, but good lower-body stability is important so that children can use their upper body to concentrate on the writing task and not having to stabilise themselves with their arms too. Although this App is for iPad only, Demografix have an iPhone App called School Fonts that features all the activities apart from the Whiteboard activities. Look in the Related Articles section below to read a review of this App by Richard on The Mactrack Blog. Resize, zoom and move images when creating and editing lessons. When adding a photo of a child to one of my lessons, I only had one of him as past of a group and wasn’t able to zoom in and move the image so just he was featured. No distortion of images – When adding a Map image to a Whiteboard activity, I used a screenshot taken from the Maps App, but it was distorted to fit in with the dimensions for the whiteboard. I’d rather it didn’t stretch but was kept in proportion. More than 12 character text limit in Word activity – I’d like to be able to type longer words, phrases and sentences. My nephews’ surname would not fit within the limit and no child with a hyphenated surname has a chance. School Writing is an open-ended App that will allow teachers and parents the flexibility to use it with their own content focusing on individual and class needs. If you have an iPhone or iPod touch, you might want to investigate School Fonts which has every activity bar the Whiteboard activity. I have linked to a review below, but basically it is the same quality and flexibility on a smaller screen. This App is one of the best-designed Apps I’ve seen and delivers great value for the price. In the “olden days” when I was teaching special education, and later in my role as an advisor for Assisitve Technology, I would cheerfully have paid $100 or more for a computer program of this quality, so to see it available for just a few dollars is remarkable. These Apps are must-haves for schools. Finally, I am ridiculously pleased to find that this App is not only Australian, but published by fellow Queenslanders. The information below is for the Apps that are available in the Australian iTunes App Store, however there are localised versions for the USA, UK and New Zealand stores. Pricing will vary. Hopefully the links below will take my international readers to the right App in the right store, but if they don’t, do a search for Demografix or go to the Demografix website and link from there.